The first week of a Delve seminar could be compared to the first day of school. You meet the teacher (in this case called a guide), you meet your fellow students (in this case allied interested readers), and you begin to see a room full of different personalities bloom. One thing I love about participating in the Delve program, this being my second time around, is that unlike when you are in school, you are on equal footing with the guide and the participants. You are all there for one reason; to share in each other’s reading experiences and opinions. We also have the privilege of our discussions being influenced and guided by Lucas Bernhardt, who teaches writing at Portland State University. 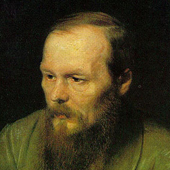 This week we discussed part one of Crime and Punishment and some general prior biases with Russian literature, and presuppositions of author Fyodor Dostoevsky. Something fortunate is that our group of readers is about 50/50 on whether or not they had read this particular novel or not before. We get the benefits of seasoned knowledge along with fresh instincts. Our group agreed that we should be hesitant to lump Russian literature as either sorrowful or desolate, we should also at the same time not expect a book like Crime and Punishment to be a cheerful read. It is the type of novel to cause self-reflection and to challenge our own institutionalized rules of morality. A reasonable portion of our discussion rested on the narrator; is it the voice of the lead protagonist, a collective being, a future incarnation, or a variably omniscient 3rd person? This led to some dissent amongst our group that is not totally settled – at least not this early into the novel. Something interesting Lucas Bernhardt mentioned was the subordinate nature of the novel. What he meant by this term was that often there is a self-corrective tale being told in this book; of saying one thing and then later contradicting a previous statement. This adds to the overall tone of the novel, and the deeper level of meanings found within the pages. Part one of this Dostoevsky’s novel contained much to discuss, and I’m afraid we only skimmed the surface of certain topics. The misogyny embroiled in the culture and the subject of the murder that takes place. Beyond the misogyny is an ambiguous area for the morality of the murder victim and the act itself. There is also the power and influence that alcohol has on the characters. Next week we move on to part two of the novel and continue to learn the complex fate of Rodya Raskolnikov.